The most vital aim of education is to empower our children and adults. Education should be such that it allows our students learn concepts and skills that would lead them to success in life. The advent in information technology has made available content and information anywhere in the world. The present generation, therefore, are more connected. They have a huge amount of information and gadgets at their disposal. Children are found spending more time with these gadgets than getting involved in physical activity tasks that earlier generations enjoyed doing. These days’ children are using multi-touch and multiple screen devices and apps. They are involved in streaming music and uploading/sharing videos. In fact, they are also capable of making apps at a very young age. Besides, the job market has also become global. The erstwhile conventional jobs of doctors, engineers and lawyers, although still sought after but there are a whole set of new non routine jobs such as Animation and Video Creators, App Developer, Social Media Manager, Event Manager, User Experience Manager, etc which are eventually becoming more and more popular. All these jobs are a result of the boom in technological coupled with innovation and creativity, defining a new global world order. In order to prepare our children to join the aforesaid global workforce where technological innovation and creativity skills are critical, the schools of 21st century will have to ensure that these skills of the students are enhanced. The schools are no more required to make students memorize data, as this is already available at the click of a mouse, but make them think and visualize proactively, relate to real life and solve the real life problems logically by using the said data. For this, schools themselves have to gradually adapt to new pedagogies which integrate science, technology, engineering and mathematics with experiential learning or learning by doing. This is exactly what a ‘STEM’ (Science, Technology, Engineering and Mathematics) curriculum does. 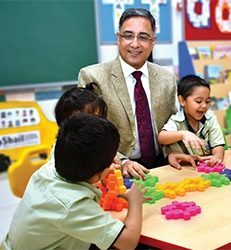 The curriculum is presently being followed at Shail Global School, Faridabad. Very useful. An appreciable effort to make learning relevant to students according to current needs. Do read the article called ‘The Saber Tooth Tiger’, which highlights this point in a very interesting manner. It is important to work towards the basic competencies, but also introduce new, relevant ones.